Lash Stiletto mascara promises to do for your lashes what stilettos do for your legs. Does it really work? 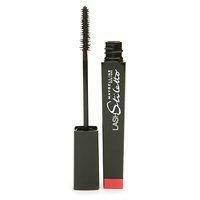 Lash Stiletto Ultimate Length Washable Mascara by Maybelline is a mascara designed to add length and shine to lashes. The mascara is sold in three shades - brownish black, soft black, and very black - in drugstores and other retailers nationwide. Features include a patented 'Grip and Extend Brush,' a conditioning formula designed to add shine as well as length, and is washable and contact lens safe. With sleek packaging, a modern design, and the promise of ultra-long, shining lashes, this mascara is a hot item from Maybelline. While my short, fine lashes need both volume and length, I couldn't resist the lure of Lash stiletto and its claim of provocative length. While the mascara didn't magically transform my lashes into the long, thick, sweeping lashes like the Maybelline models that I dreamed of, it is still a great mascara that did add both shine and length to my lashes. I tried Lash Stiletto in very black, purchased at a Rite-Aid drugstore for $8.49. The Grip and Extend brush is easy to use, and does a great job of grabbing individual lashes. The mascara formula is light and doesn't feel stiff, sticky, or overly heavy. The mascara did add shine to my lashes and resisted smudging or bleeding, even in hot weather. Lash Stiletto does add length and a fair amount of volume. The product did not clump and washes off easily. During application, the mascara has an unusual small. It wears off quickly and doesn't linger once mascara is applied and has dried. Perhaps as a result of the conditioning and elastic formula, the mascara did not seem to hold the curl in my lashes as well as some other mascaras I've tried. For me, the lengthening effect wasn't quite as dramatic as it seems to be advertised as. Overall, I would give Lash Stiletto mascara four stars - it's a good buy from a trusted name in cosmetics. While it may not give you the same effect as false lashes might, it will lengthen and increase shine without clumping and smudging. I found that while adding more than one coat increased the intensity and definition of my lashes, the less I applied, the better it held curl. The mid-size wand also grabbed and coated lashes as well as a mini-brush mascara.